Craving for some comfort food?! 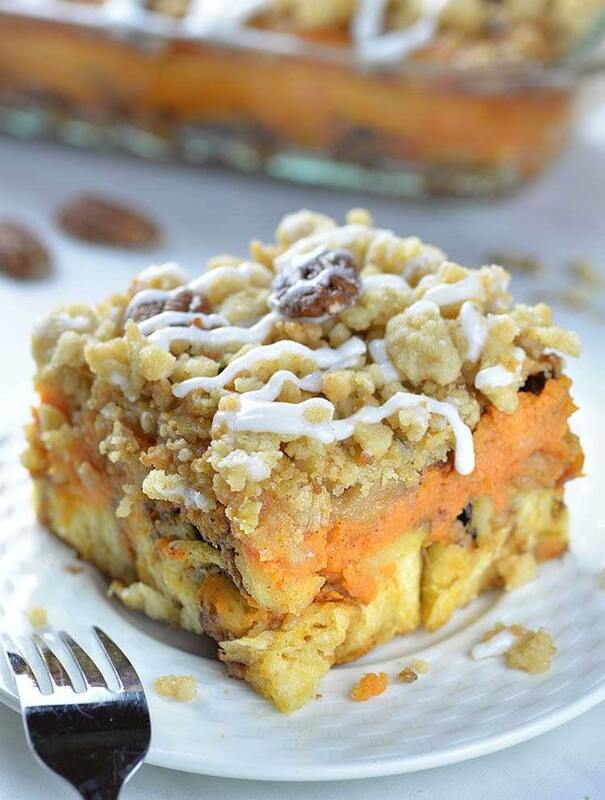 Pumpkin Pie Cinnamon Roll Casserole topped with brown sugar pecan streusel is quick and easy breakfast or brunch for pumpkin lovers, or just a simple dessert for unexpected company. Super moist and soft cinnamon roll layer topped with gooey pumpkin pie filling and crumb topping is the best fall comfort food. It will make you feel cozy and satisfied. Pumpkin Pie Cinnamon Roll Casserole would be great as special, festive breakfast or brunch for Thanksgiving or Christmas, too. But this recipe is so simple and easy to make so you can treat yourself anytime with this yummy casserole. It doesn’t matter if it’s pumpkin season or not, you can make this throughout the entire year thanks to canned Pumpkin. And if you try it, I’m sure you’ll stock your pantry with cans of pumpkin puree. For this recipe you’ll use refrigerated cinnamon roll. Filling is also really simple and uses just a few ingredients that should be whisked by hand. And the top layer, brown sugar pecan streusel, is also done in a minute. As a matter of fact all three layers for this Pumpkin Pie Cinnamon Roll Casserole is ready for the oven in less than 15 minutes. When it’s baked drizzle the icing on top and enjoy! And I’m sure you’ll enjoy in this layered casserole. Bottom layer is formed by pieces of chopped cinnamon rolls. They are baked perfectly and stay soft. Actually the whole layer is irresistible, like the super moist center of classic cinnamon rolls which is actually the best part, right?! Then, middle layer is soft and gooey pumpkin pie filling. 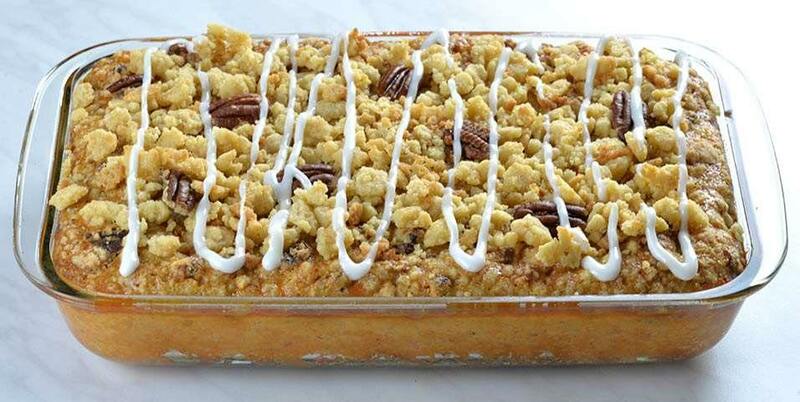 Finally, the top layer is crumbly brown sugar pecan streusel drizzled with icing. I can’t imagine tastier fall comfort food nor easier to make. Pumpkin Pie Cinnamon Roll Casserole would be great as special, festive breakfast or brunch for Thanksgiving or Christmas, too. 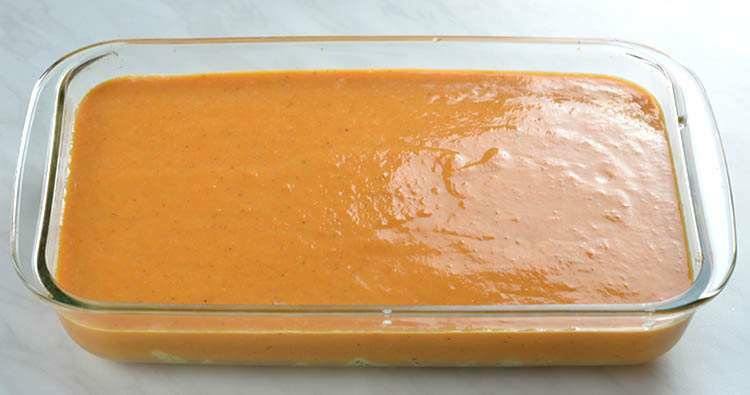 Preheat the oven to 350 F. Grease 7 x 11 inch glass or ceramic dish with non-stick spray. 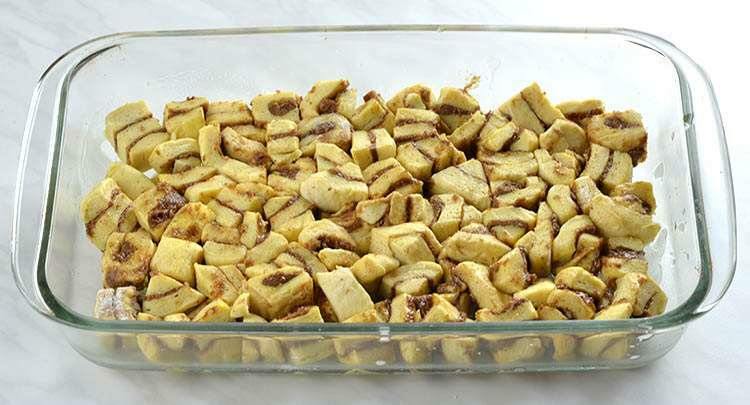 To make the topping, in a bowl stir together the flour, sugar and pecans. Then, add melted butter and stir with the fork until all evenly moistened and created pea size crumbs. Set in the fridge until ready to use. Now make the filling. In a bowl combine all filing ingredients and whisk well until smooth and evenly combined, set aside. Open the tube of refrigerated cinnamon rolls and separate the rolls on lightly floured working surface. Cut each roll in small ½ inch pieces. 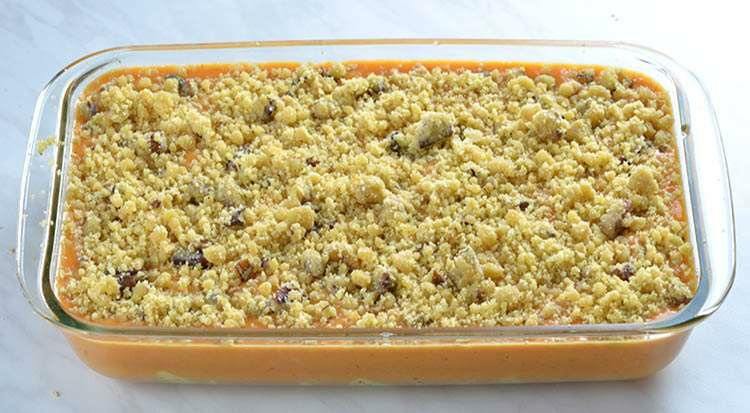 Arrange the pieces in single layer to cover the bottom of greased casserole. Pour the filling over the cinnamon roll layer. Sprinkle half of the streusel on top and reserve remaining mixture for later. Cool about 25 minutes before drizzle the icing. I’ll have to leave the pecans out for my allergic daughter (and put them on my own piece), but my family will love this! 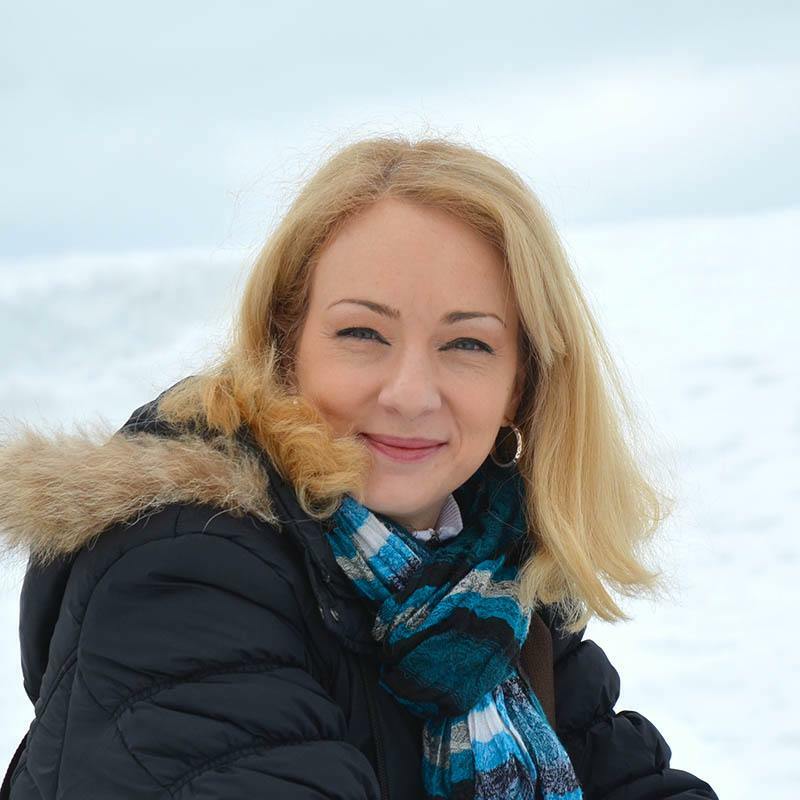 Hi Aletha,sorry to hear that,I don´t know what went wrong. Hi Maggie, sorry I can’t help you with that.I haven’t tried this recipe in crock pot. Should you refrigerate casserole after baking? Hi Pam, serve it at room temperature and store leftovers in the fridge. Can I use canned pumpkin pie filling for this? Hi Connie, I suggest you to follow the recipe exactly, I don’t know how it would work with pie filling instead of a pure pumpkin. 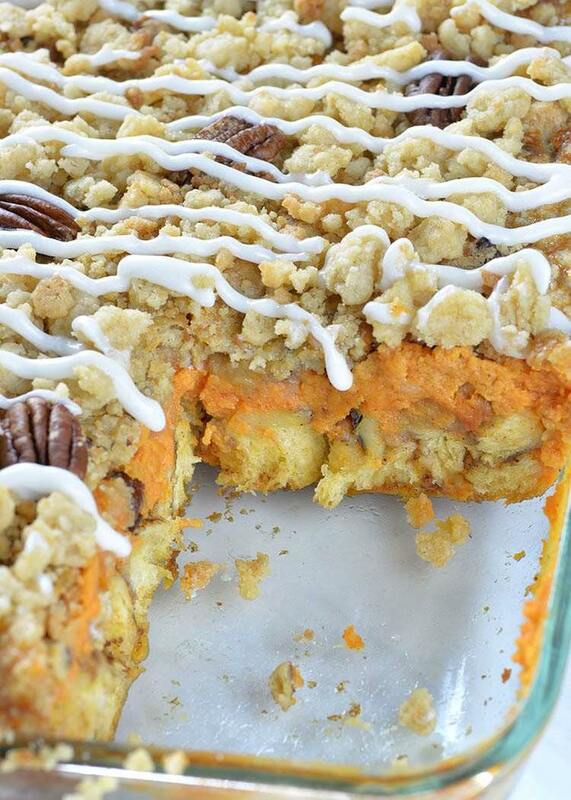 I am going to try this this weekend using pumpkin cinnamon rolls pillsburry has out right now. pumpkin overload!! Wondering if this could be frozen?